Create customized, branded proposals in just minutes for your clients. 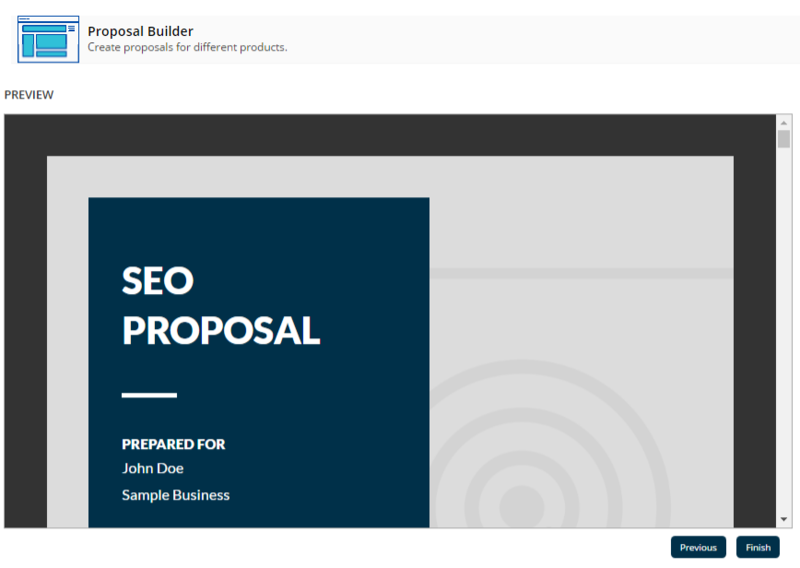 With our Proposal Builder, it's easy to create customize, branded proposals that you can send to your clients when pitching. It all happens right on your White Label Dashboard. Log into your account and go to the Tools section of your Dashboard. In your Proposals Dashboard, click the Create New Proposal button. 3. Choose and Edit your Lead Information. Use the drop down menu to get your Lead Information. Edit the details and check if the information is correct. You can also +Add New Lead. 4. Edit your business information. If you need to make changes to your business information, click Edit Your Information. This will take you to the Business Details section of your White Label Dashboard Setup. 5. Choose your Proposal Settings. When you're done, click Next for your Pricing Information. 6. Choose your product offering. Use the drop down menu to choose the category and the specific product offering you will include in the proposal. This will show the option to set your monthly pricing and your profit. Note: Your monthly pricing cannot be lower than the original price. Click Next when you're finished setting the pricing. You will have a preview of your proposal after setting the details. Use this to review the information before completing. When you're done, click Finish. A message prompt will appear saying that your proposal is ready for viewing and download. With the proposal ready, you can now start pitching your service to your clients!